This Cardboard Commentary isn't really about cards or cardboard at all, but I was so excited about this, I wanted to share it with you! As many of you know, I've been really getting into the Sacramento Kings basketball team. The Kings are just a 15 minute drive away from my home, and this year I was fortunate enough to get season tickets. I've really gotten into them, especially in the area of photography... and today I had a gallery of photos featured on the Sacramento Kings homepage! Check out the photo above! 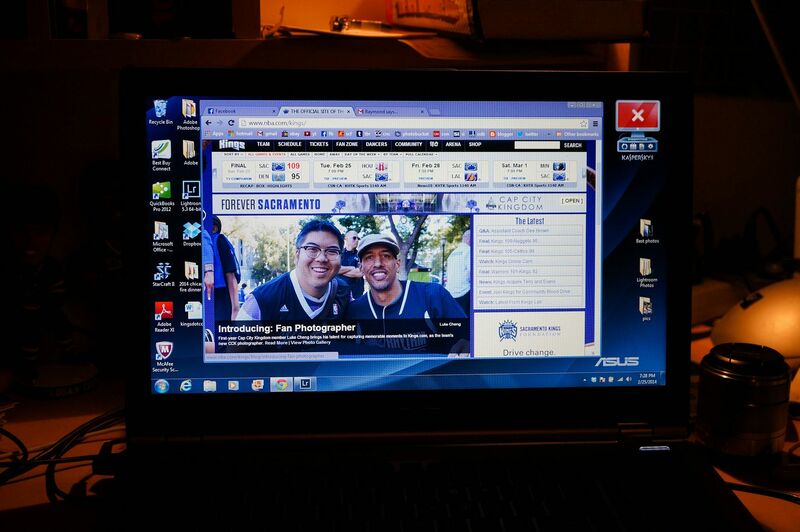 Yup, that's me on the main page with former Sacramento King Doug Christie. I'll be on the homepage until the next main story comes up, but to capture the moment I took this photo above. If you'd like to see my article and view my gallery, CLICK HERE. I appreciate all of you who check it out! Because of this article, I was also featured on their Instagram account. Wow, lemme tell you, once you get featured on something like this crazy stuff can happen. My Instagram was blowing up! If you'd like to see my photos from Kings games, feel free to give me a follow on Instagram. My username there is blacksheep217. And finally, I also have a blog on the Kings as well. That blog talks about my own fan experiences as a season ticket holder. If you want to visit that site, CLICK HERE. That's for indulging me on this post! I'm just very excited to have had this opportunity to collaborate with the Sacramento Kings NBA team. Thanks for your support! This is really cool. What an awesome privilege. You deserve it. Good job!